If investing in fine art is way out of your budget, don’t think that you have to live with bare walls forever. 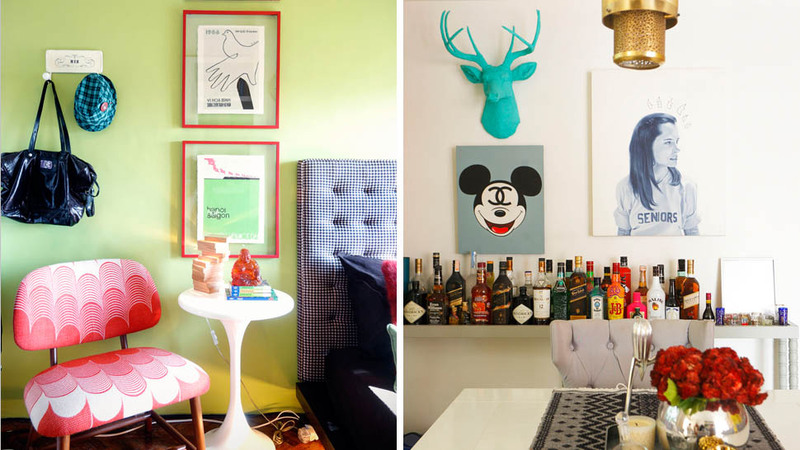 A gallery wall consisting of a mishmash of posters, your kids’ artwork, fun postcards and even repurposed wall calendar art can turn out to be a total scene-stealer. But if you want to start collecting, limited-edition prints and small paintings are also a good option for people who want to dip their toes in art but haven’t got the spending power. Here are the Instagram accounts to follow if you want to order, or simply browse through them to get visual inspiration for your space. Once you pick your artwork, have them professionally framed, mix them up with old posters and your children’s artwork, et voila, the beginnings of the Louvre can start right in your living room. Illustrator Anna Bond’s whimsical gouache paintings of whimsical florals, travel destinations, and classic children’s book characters have earned her brand, Rifle Paper Co. a cult following. With collaborations that stretch from LeSportsac to Keds, nabbing a Rifle print is like owning a piece of pop culture. If you can afford her retro-whimsical prints, check out her small stationery goods like notebooks and cards, instead. Local artist Raine Sarmiento has been making waves on and offline with her delicately detailed drawings that juxtapose pretty pastels against sometimes dreamlike, sometimes macabre scenarios. With prints that range from P80 to P6,000, you’d be doing yourself a disservice if you didn’t get a piece. Young visual artist and illustrator has packed her bags and moved to San Francisco, but her Instagram account continues to provide visual inspiration to everyone with an eye for dreamy watercolors and surreal art. It’ll do you good to follow her and see when she opens up her shop for custom commissions again! The younger brother of artist Tokwa Peñaflorida and son of Mayi—also a painter—has created a name for himself with his portraits ethereal, fairytale-like women with a hint of darkness. He reveals his reasons for his preference for female subjects: “Mas expressive sila. Kapag masaya sila, pinapakita nila. Pag depressed, kitang-kita mo.” Aspace in Makati carries his works, and he sells in various art fairs, but he also accepts commissions. The perfect Instagram account to stoke your love affair with this romance language, French Words creates art out of everything from idioms to quotes, everyday words to pearls of wisdom. The feed gained so much traction, it spun off into an actual print shop that sells charming prints in a range of sizes. Husband and wife vloggers Stef and Hannah Michalak don’t just produce weekly vlogs on YouTube, they’ve created a bit of a business for themselves. The Maggs London Prints series takes quotes they incorporate on their videos and splashes them elegantly in rose gold on high quality paper. PS: The cheeky “insufferable hipster tw*ts” print is a reference to a troll comment they received online. Portland-based illustrator and card shop owner Yas Imamura has built a name for herself with fun and cheeky prints that have garnered her a collaboration with specialty retailer Anthropologie. Formerly based in the Philippines, Yas proves that Filipinos can definitely go the distance with art. This fashion punk artist recently took over the fashion world with her fun and colorful collaboration with Gucci. Her Instagram feed is filled with irreverent puns and intelligent conjecture on pop culture. If you’re a diehard fashion girl, you’ll want her work on your boudoir.